‘Highty Tighty”is a cream puff of a classic 45 Viking, currently only on her second owner since new. She is powered with original Detroit Diesel 485hp 6-71 TIB’s with low hours, and the engines have never been rebuilt. The gelcoat shines, as she spent most of her life in a boathouse, her interior is completely original and in good condition. The helm has been outfitted with some newer electronics from Raymarine. This classic 45 is turn key and ready to go. Call today to schedule your showing, you will not be disappointed. 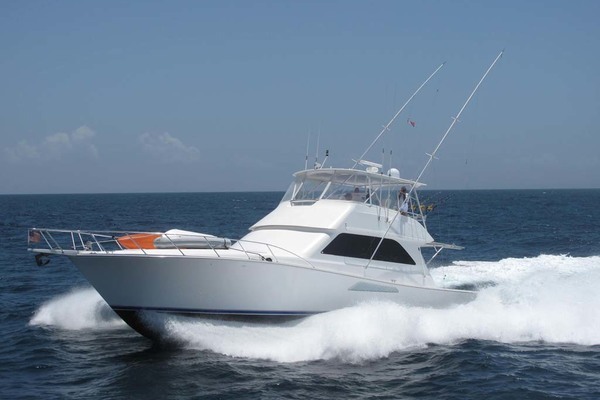 United Yacht Sales New Jersey would love to guide you through a personal showing of this 45' Viking 45 Convertible 1988. This yacht for sale is located in Long Island, New York and priced at $99,900. For a showing please contact us by filling out the form on this page and we will get back to you shortly! Entering the salon from the cockpit, a large L-shaped settee with pull-out double berth is located to starboard while a swivel chair is located to port and forward to starboard is the entertainment center console. Down a few steps you will find a well-appointed galley to port and a large U-shaped convertible dinette to starboard. The companionway is equipped with a full day head with shower and a full sized linen closest with the washer and dryer. The master stateroom is forward and features an island queen berth with integrated storage, dual cedar lined hanging lockers, overhead storage lockers and full en-suite head with stall shower. Engine room access is located via the salon steps at the galley.